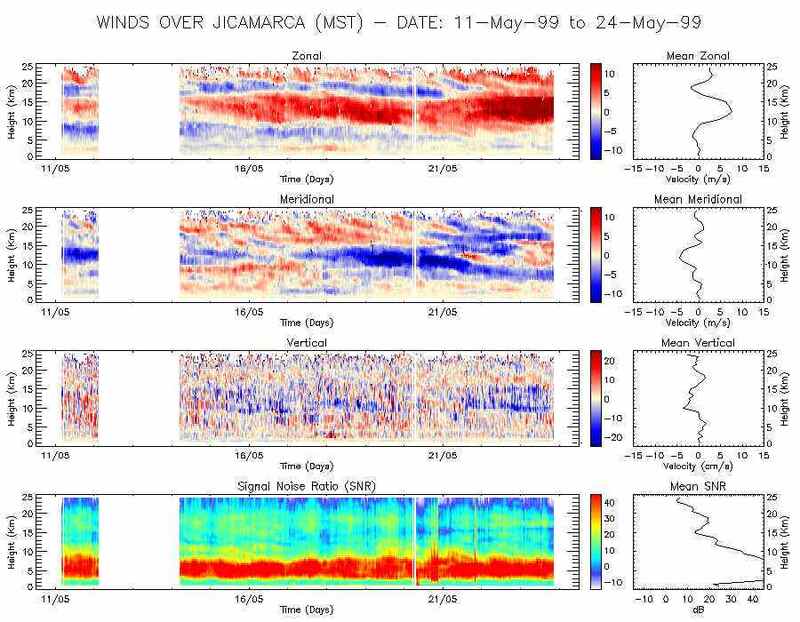 The Mesosphere-Stratosphere-Troposphere (MST) modes are intended to get height profiles of wind and turbulence measurements above Jicamarca. This technique was first developed at Jicamarca in the early 1970's [ Woodman and Guillen, 1974 ]. Since then it has rapidly evolved and nowadays there are many radars that use it around the World. However, the majority of these radars are smaller and less powerful than Jicamarca and therefore are only able to get measurements from the lower atmosphere. For information about the theoretical and technical details on the MST technique, consult the article " MST and ST Radars and Wind Profilers " (by R. F. Woodman). There are mainly two methods employed at Jicamarca to get MST measurements: Doppler beam swinging (DBS) and Spaced Antenna (SA). The DBS measurements at Jicamarca are usually made with four predefined beam positions using pre-wired half-antenna sections. All 4 beams are symmetrical respect to vertical pointing to the E, W, N and S directions and tilted only ~2.5o, because the antenna phasing is done between modules. When the MST transmitters are employed, useful measurements can be obtained between 4 and 25 km. In addition, these measurements can be done unattended and for long periods. On the other hand, when the big transmitters are used, measurements can be extended up to mesospheric heights, including most of the stratosphere. 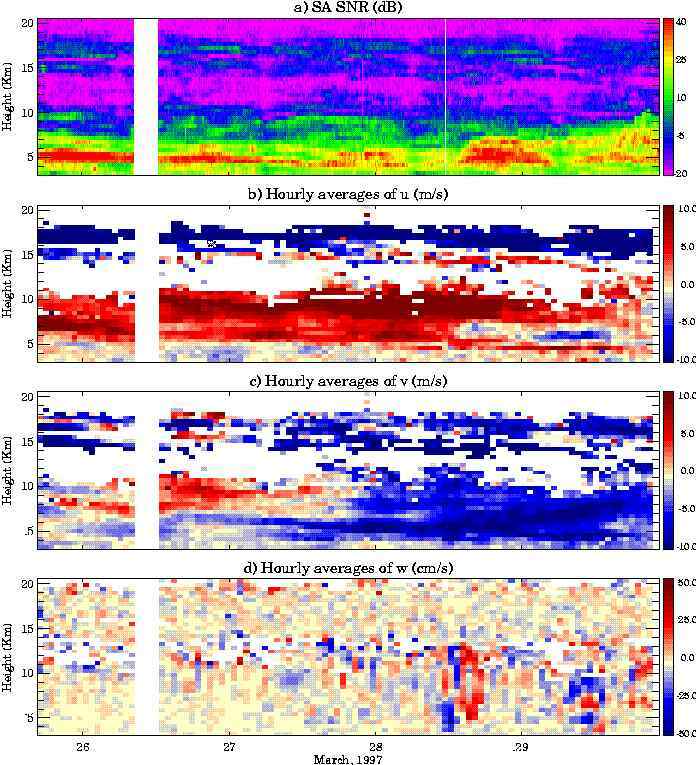 However, mesospheric echoes are only obtained during the day. Moreover, the lowest useful height is ~12 km due to strong clutter. Below is an example of the zonal, meridional and vertical winds obtained in the low power mode. Spaced antenna measurements are also possible at Jicamarca using 1/4 or 1/64th sections as receiving antennas. Details on these SA measurements can be found in Royrvik  for mesospheric measurements and Chau and Balsley  for lower atmospheric measurements. This mode also allow us to get correlation lengths of the scatterers and corrected turbulence intensities [ Chau et al., 2000 ]. Below is an example of lower atmospheric measurements using the SA mode.